Imagine your home is located on a secluded mountain-side with rolling hills lined with beautiful trees. 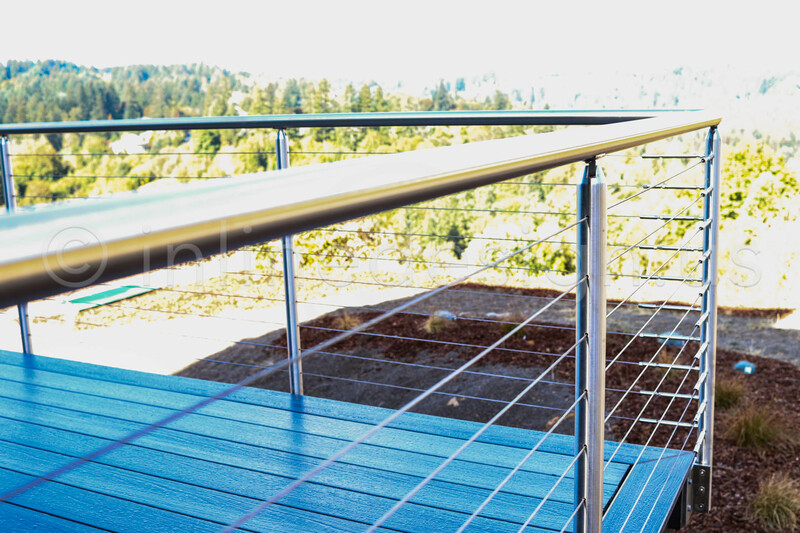 You’re interested in installing brand-new railing along the outside of your home so that no matter where you stand or sit, your view of these beautiful rolling hills isn’t obstructed at all. Andy Vu of Oregon had this predicament. He had a beautifully constructed home that allowed for astronomical views, no matter if you were in or outside the house and he wanted to keep it that way. 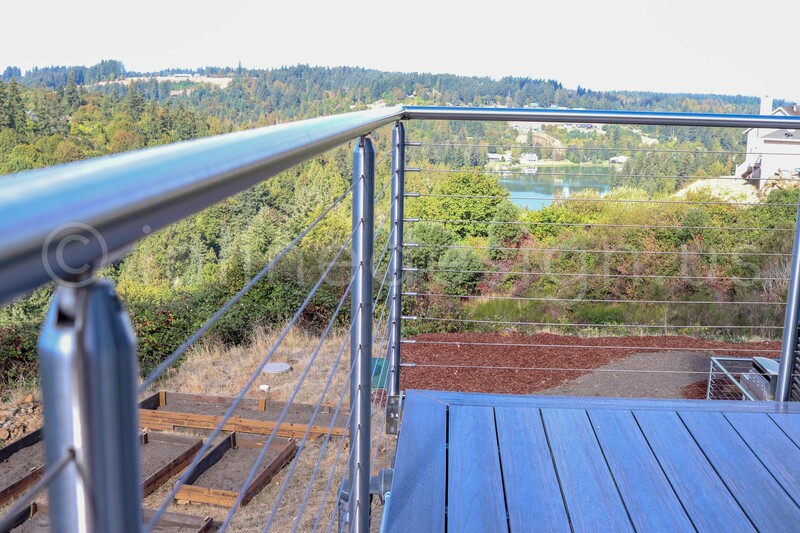 Andy did his research in deciding if he wanted to install glass or stainless steel railing systems. 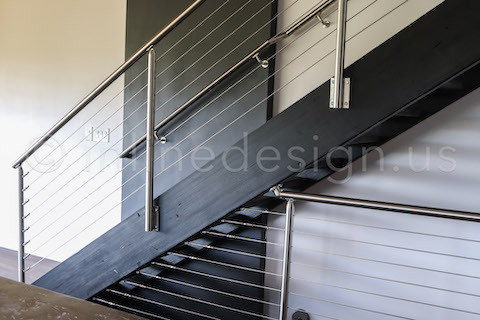 He knew for sure he wanted to keep the aesthetic consistent both inside and outside of his home, so he weighed the pros and cons and came to the conclusion that a stainless steel handrail system and cable railing system would work best for his homes’ current interior and exterior design aesthetic. Once Andy had a direction he wanted to move towards, he began to do his due diligence and research companies that offered the “vision” that he had for his home. He spent time at Home Depot and at Lowes, but he couldn’t find just what he was looking for. After a while, Andy landed at Inline Design and fell in love with some of the design possibilities we had to offer. In October of 2016, Andy reached out to us with questions regarding our products and was greeted by Tan Vu, one of our experienced and friendly sales representatives. After a few emails, Andy felt confident in his choice in railing! 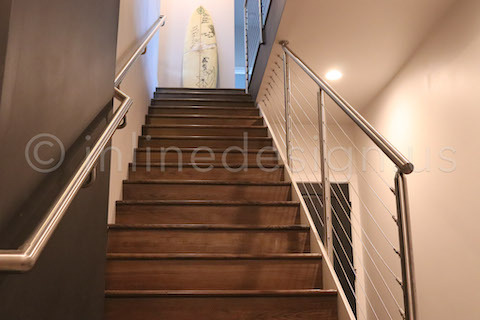 He chose the stainless steel cable railing system to go inside and outside of his home for a cohesive and streamlined look and feel. The best part of his choice was the railing system would call for an unobstructed view of the amazing rolling hills outside of his home! Tan was able to draft a quote for Andy right away and also made sure to include instructions on how to attach the posts to different surfaces as well as how to drill and tap holes for brackets. Tan also wanted to ensure Andy was fully equipped and aware with how his system may turn out, so he made sure to include specific links to our virtual showroom and client gallery which shows a completed project with a similar railing system Andy was interested in – the Press and Latch, Side Mounted, Cable Railing System! Throughout the next couple of months, Andy continued to reach out to Tan with any questions he had regarding his property and how the cable railing system may work for the staircase inside his home and the large deck on the exterior of his home. Tan always made himself available to answer questions, give examples and provide quality insight to ensure all of Andy’s questions were answered properly and timely. Their relationship really blossomed over the next few years as they started working out a plan to complete Andy’s home project. Andy spent some time throughout April of 2018 communicating with our trusted CAD specialist, Vince Tran. Vince delivered state-of-the-art CAD drawings of Andy’s interiors and exteriors thanks to all of the measurements that Andy happily obtained from his property. The excitement of adding cutting-edge designs to his home really showed through the phone calls and exchanged emails. Andy was beyond thrilled to be adding to the value of his property all while managing the entire process with Inline Design in his back pocket as a support system and without having to pay a vendor to help explain things or break costs down. Andy continued to spend one-on-one time with our specialists to ensure the measurements were correctly taken and cut to perfection to eliminate the risk of mistakes, and that is something he is so proud of! Throughout the next few months, Andy’s order was completed and shipped. As logistic and shipping questions came about, they were managed by Inline Design’s trusted Office Manager, Simonne V., who stayed on top of Andy’s order whereabouts to ensure a timely delivery and to maintain an excellent customer relationship! Simonne ensured Andy received every last package from his order and continued to offer support throughout the rest of his home improvement adventure with Inline Design. Once Andy had everything properly placed and installed, his excitement for a job-well-done was through the roof because his aspirations for his beautiful home had finally come to fruition. 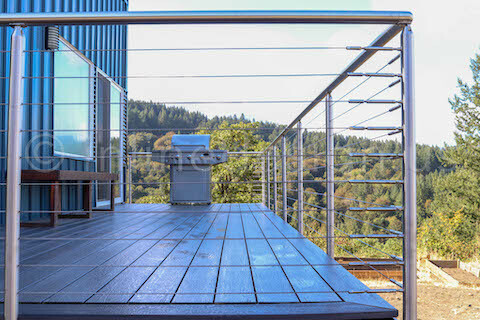 He was able to craft a sense of security and safety in and outside of his home with our trusted, modern cable railing system all while still being able to enjoy the views from inside and outside of his home. In June of 2018, Andy reached back out to his trusted ally, Tan, to return a few extra stock pieces of stainless steel round tubes. Tan, as always, was happy to hear from Andy and couldn’t want to assist him with simple return procedures! The fall weather started to roll in, and come October 2018, Andy sent us some absolutely beautiful photos of his masterpiece. We were taken aback, and quite frankly, we were so proud of not only the finished version of Andy’s deck and interior stair railing, but of the relationship we built with Andy over the years. The patience, the laughs, the teamwork, the trust – we are so happy to call Andy a part of the Inline Design family and we cannot wait to help him on his next home adventure! Check out Andy’s take on his relationship with us, here at Inline Design from his Yelp review below, and be sure to check out the finished product of Andy’s deck and interior stairway. communication with the client for the best possible experience. After a few revisions, Andrew decided to use our Press and Latch, side mounted, Cable Railing System, for his deck. Inside, he chose our Stainless Steel Handrail Wall Bracket Redshift Quasar. When combined with the cabling, this added an airier, more open appearance. Outside, the railing on the deck gave him an unobstructed view of the surrounding countryside. The results are stunning! Scroll down to see for yourself!